The Commissioner for Human Rights, Dunja Mijatovic, recently visited Paris to discuss issues of human rights violations relating to the Gilets Jaunes (GJ) or Yellow Vest protests that were sparked in France on the 17th November 2018. The protests, that began peacefully descended into state violence against civilians from the 24th November onwards. “The heightened tensions that persist now in France have triggered my concern and I consider that there is an urgent need to appease the situation” Mijatovic said after her visit. Mijatovic was particularly alarmed by the increasing number of civilians and bystanders seriously injured by the use of the LBD40 “flashball” bullet and the Grenades d’encerclement or GLIF4 grenades. To date, 159 people have been hit in the head by the LBD40 rubber bullets, causing fractured jaws, 17 loss of eyes, one induced coma and many other serious and debilitating injuries. 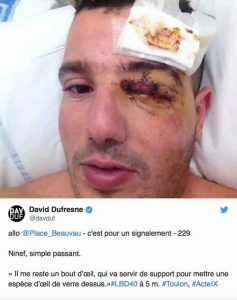 The protestor was hit in the face by an LBD40 bullet during Acte IX of the protests in Nimes. He suffered a fractured jaw, 3 upper teeth were torn out and his lower teeth were displaced. “The CRS (civilian reserve police) didn’t allow us to rejoin the firemen and they told me that it served me right” said the injured GJ. An article in Le Monde revealed that 9,228 LBD40 bullets have been fired during the two months of GJ protests. 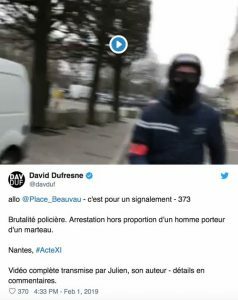 Desarmons.net, a collective of activists against state violence in France, have calculated that this number equates to 1,000 shots per week or 838 bullets fired during each protest, which are held weekly. 123 bullets fired per day from November 17th to 31st of January 2019. 159 civilians have now been hit in the head by the LBD40 bullets. Desarmons also make the claim that most of the bullets do hit their target and the weapons are extremely accurate, so this would suggest a far higher number of injured among the GJs than the 2-3,000 recorded by most analysts. What is rarely discussed by state-aligned media is the psychological trauma suffered by civilians who have been mutilated or have witnessed the hideous effects of these bullets often fired at close range into crowds. In an interview with Inter, Dr Thines explained why he had been persuaded to intervene. 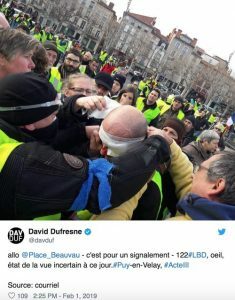 “I am not a politician, above all I am a doctor and a citizen of France – I was so shocked, as a neurosurgeon, by the seriousness of the wounds inflicted upon peaceful protestors”. Although Besancon itself has not witnessed the extreme use of the LBD40, Thines has seen the reports of surgeons across France on head injuries treated in their hospitals. Thines describes the injuries as equivalent to war wounds or the result of a serious traffic incident. Thines tells Inter that the petition has raised 65,000 signatures to date from medical staff, including paramedics who have to deal with the injuries at the scene. “We can’t remain silent” Thines said “..what we are witnessing is intolerable both medically and from a humanitarian point of view”. Thines has the view that the Minister of Interior, Castaner, has a political agenda behind his drive to strike fear into the GJs and to dissuade them from demonstrating. 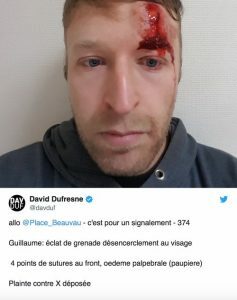 Acte XII – photo of Jerome Rodriguez, GJ spokesperson, who was targeted by a GLIF4 grenade before being hit in the eye by an LBD40 bullet on 26th January 2019. Their life is permanently ruined. They are simple, peaceful citizens of this country who were exercising their right to protest against a capitalist dictatorship which refuses to allow them to live a dignified life. 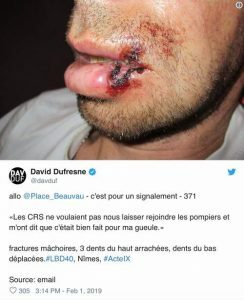 The Council of State (Conseil d’Etat, highest administrative jurisdiction) officially declined to forbid or even suspend the use of LBD40 bullets, despite all available evidence that are being used against all rules of police engagement and are causing terrible mutilation to civilians, risking life in many cases.